This novel has its own Wikipedia entry (not written by the author). 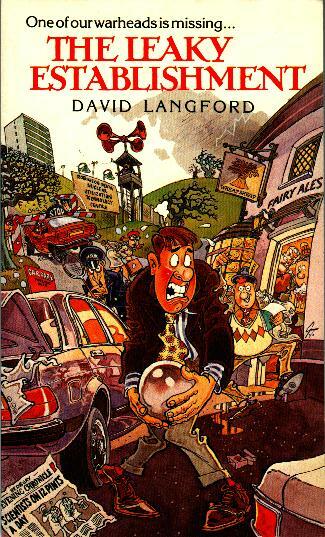 Dave Langfords comic writing deserves to be better known outside the circle of enthusiasts who have known about his talent for years. The Leaky Establishment is invested with all the delightful characteristics found in Daves humorous fanwriting. He has the same flair for lucid prose found in a lot of UK writers, from Bob Shaw to C.S. Lewis; maybe its the educational system. As a stylist, Dave ruthlessly trims away scaffolding words. [...] As a humorist, he engages in lots of sophisticated wordplay, and moves freely between the high-brow and low-brow. ... In its depiction of the bureaucracy-bound Civil Service and the antique security officials who treat one's safety infractions with "all the disdain of a chef discovering fruit bats in the ananas au kirsch", the book is spot on. I could go on for days about my favorite bits, but I'll contain myself. What I will tell you is this, if you don't read this book you are missing the best time you can have without being arrested. Go to [the Big Engine site]* and buy the book, Terry Pratchett says so (No, really he did. He wrote the introduction, I promise). It's a comedy of errors in a classic British mode. It's a satire that pokes fun at incompetent functionaries. But it also casts a very chilly eye on technical experts who get so used to dealing with very dangerous materials that they neglect reasonable precautions and, indeed, get extraordinarily reckless. If you can find or order a copy, you'll enjoy it. Langford draws his characters with sharp lines and plenty of quirkiness. His insider knowledge of the industry makes for total believability. And his joker's dialogue, sense of timing and plotting are nigh perfect. Too bad Peter Sellers isn't around to star in the film adaptation of this book: The Leaky Establishment is a perfect vehicle for his style of manic officiousness. This is a lively book, one that deftly satirises the excesses and paranoia of the security community. It has some memorable characters and grand comic set pieces, taking well aimed pot shots at bureaucratic muddle-headedness and red tape, like a modern and more purposeful equivalent of P. G. Wodehouse. Archly humorous satire ... Although Langford plays this for laughs, there are some sharp barbs in it, and I really enjoyed the characters and their progressively frustrating experiences. ... Page by page the book is hilarious: almost too densely so, in that as a novel it loses momentum. Still, it's neatly plotted, with a particularly nice resolution. And the bureaucratic tics of a government facility, exacerbated by nuclear security requirements, ring very true indeed. 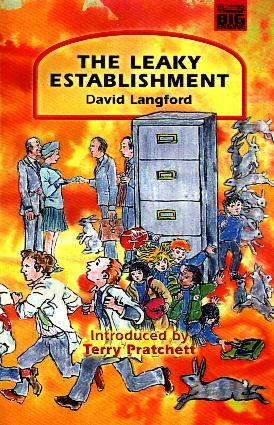 The Leaky Establishment is a welcome imprint, by an enterprising new independent publisher, of David Langford's 1984 satirical farce set in a British nuclear research centre. It was admired when it first appeared, not least by Terry Pratchett, who supplies an introduction to this edition, but then mysteriously fell out of print. It's not strictly a crime novel, though it does involve its everyman hero breaking the law in a fairly dramatic way while trying to outwit the Ministry of Defence police, after accidentally taking a plutonium "pit" home with him. He discovers that it's easier to smuggle nuclear weaponry out of his workplace than it is to smuggle it back in. Very funny and very frightening, this book will confirm every cynical thought you've ever had about Britain's "independent nuclear deterrent" – and then some. I don't want to worry you, but the author used to work at Aldermaston. 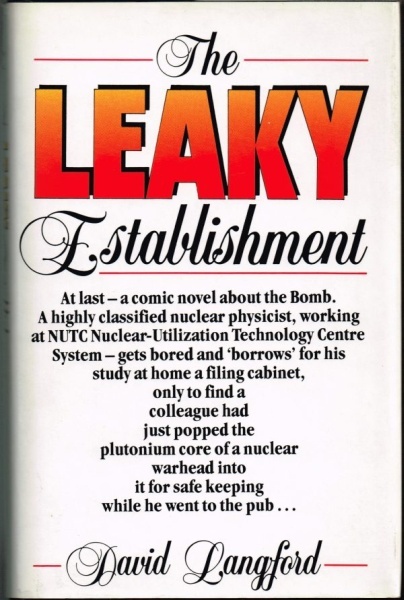 The Leaky Establishment concerns the trials and tribulations of one Roy Tappen, a scientist at the Nuclear-Utilization Technology Centre at Robinson Heath, who discovers that sneaking the plutonium core of a nuclear warhead out of the centre is easy enough; the problems arise when he tries to sneak it back in. It's either a gloriously absurd farce or a sober record of The Great British System disguised as a gloriously absurd farce: whichever way round it's the kind of book you can give to spouses/partners who can't stand SF. The Leaky Establishment has that quality belonging to genuine farce, best described as delighted frustration – frustration because Tappen is blocked at every turn, difficulty piled on impossibility, until it seems that the plot can never be resolved; and delight, because these impossibilities are comic, one has the immense and reprehensible satisfaction of seeing some other poor bugger in the mire. For the most part, the tone is light. At several points, though, there are realistic touches that serve to anchor the book: when Roy Tappen looks up from his frenzied dashing around,, and realizes just what a lunatic world he's helping to run – that his evasions, and practical jokes, are a way of fighting back; that if he didn't laugh, he'd cry. More stress on that would have made the humour blacker – but it would be foolish to carp when The Leaky Establishment as it stands is a very funny book. How David Langford keeps up his high spirits is a wonder.